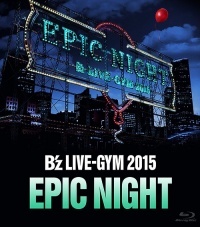 B'z LIVE-GYM 2015 -EPIC NIGHT- is a home video by B'z, released on February 26, 2016 on DVD & Blu-ray. The release serves to record the finale of B'z LIVE-GYM 2015 -EPIC NIGHT- in its entirety, which toured in support of the band's nineteenth studio album EPIC DAY. Performed with only Tak and Koshi on the small stage on the far side of the arena, with Koshi on harmonica and vocals and Tak playing only an electric guitar. This page was last modified on 6 June 2018, at 05:44.